Many American political leaders paid rich tributes to Republican Senator and former presidential candidate John McCain, who passed away on Saturday after a prolonged illness. McCain breathed his last at his home in Arizona at the age of 81, his family announced on Saturday. From US President Donald Trump to Speaker of the House Paul Ryan, a number of politicians took to their social media handles to express condolences for the departed soul. Trump, who shared a rocky relationship with McCain tweeted, "My deepest sympathies and respect go out to the family of Senator John McCain. Our hearts and prayers are with you!" US Vice President Mike Pence also paid his tribute and hailed McCain for his lifetime services to the country. "Karen and I send our deepest condolences to Cindy and the entire McCain family on the passing of Senator John McCain. We honour his lifetime of service to this nation in our military and in public life. His family and friends will be in our prayers. God bless John McCain," Pence wrote on Twitter. McCain's wife, Cindy McCain also tweeted about her husband's demise, saying that her "heart is broken" and is "so lucky to have lived the adventure of loving this incredible man for 38 years." She tweeted, "My heart is broken. I am so lucky to have lived the adventure of loving this incredible man for 38 years. He passed the way he lived, on his own terms, surrounded by the people he loved, in the place he loved best." Former US President Barack Obama also paid his tribute to the 81-year-old Republican Senator. He said in a statement, "John McCain and I were members of different generations, came from completely different backgrounds, and competed at the highest level of politics. But we shared, for all our differences, a fidelity to something higher - the ideals for which generations of Americans and immigrants, alike have fought, marched, and sacrificed." "Few of us have been tested the way John once was or required to show the kind of courage that he did. But all of us can aspire to the courage to put the greater good above our own. At John's best he showed us what that means," he added. Obama's predecessor, George W Bush described McCain as "a man of deep conviction and a patriot of the highest order." In a statement, Bush said, "Some lives are so vivid, it is difficult to imagine them ended. Some voices are so vibrant, it is hard to think of them stilled. John McCain was a man of deep conviction and a patriot of the highest order. He was a public servant in the finest traditions of our country. And to me, he was a friend whom I'll deeply miss. Laura and I send our heartfelt sympathies to Cindy and the entire McCain family, and our thanks to God for the life of John McCain." Speaker of the House Paul Ryan said that it is "a sad day for the United States and our country has lost a decorated war hero and statesman." "This is a sad day for the United States. Our country has lost a decorated war hero and statesman. John McCain was a giant of our time-not just for the things he achieved, but for who he was and what he fought for all his life. John put principle before politics. He put country before self. He was one of the most courageous men of the century. He will always be listed among freedom's most gallant and faithful servants. Our hearts are with his wife, Cindy, his children, and his grandchildren. This Congress, this country mourn with them," read a statement by Ryan. 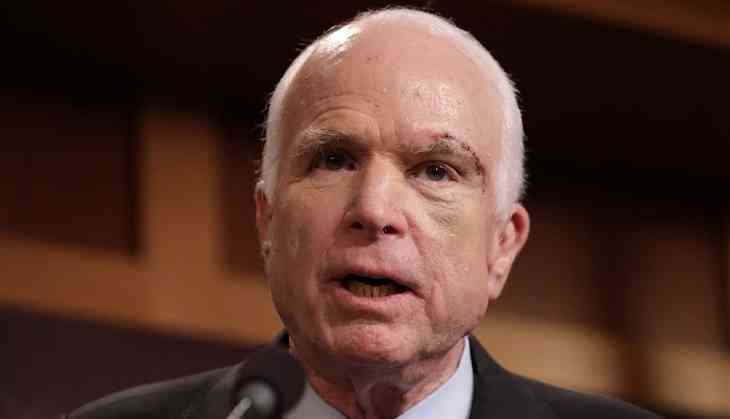 Last year, McCain was diagnosed with primary glioblastoma, a type of brain tumour, and was operated upon to remove a blood clot, in Phoenix, Arizona. In April this year, the senator underwent another surgery to treat an intestinal infection related to diverticulitis. On Friday, his family announced they had stopped McCain's treatment. McCain, who was always at loggerheads with Trump, had called on the latter to stop cornering the American media. He also termed Trump's administration attitude towards the press "inconsistent at best and hypocritical at worst," according to an op-ed published in The Washington Post. The 81-year-old senator had fought in the Vietnam War between the late 1960s and early 1970s, was captured by the Vietnamese troops and declared a 'prisoner of war'. He retired from the US Navy in 1981 and joined politics thereafter.